The number of organizations that allow BYOD is constantly growing (55%-65% allow it). With this number expected to grow exponentially, it becomes even more important for organization’s to have the right foundation to support their employees but also their customers. 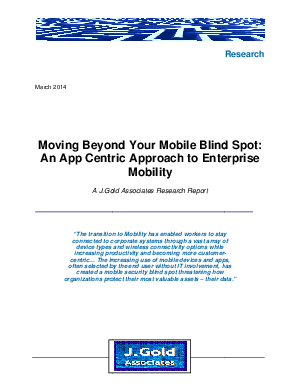 Download this whitepaper to learn how to achieve an app centric approach to enterprise mobility and see how this will enable workers to stay connected to corporate systems through a vast array of device types and wireless connectivity options.